Throughout my school years, I would savor nasi lemak, wrapped in green banana leaves, at least three times a week. 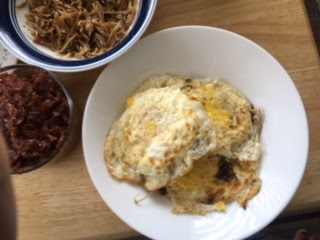 Inside the bundle was warm coconut rice infused with the vanilla-like aroma of pandan leaves and citrusy ginger accompanied by a hard-boiled egg, crispy fried anchovies and peanuts, a few slices of cucumber, and a dollop of sambal — flavors that are still etched in my mind. The list could go on according to individual preference. Sit back and enjoy this delightful plate of Sara’s Asian Cuisine cravings at the comfort of your own kitchen. The fragrance of this dish comes from the rice which is infused with coconut milk. “What makes a great Nasi Lemak” and almost everyone will agrees that it’s definitely the sambal and rice that made you lick your plate clean. Rub the fish with 1tsp of salt and let it stand for 10 minutes and risen. Pat dry and all the ingredients into a large bowl and rub the fish well. Marinate overnight. Heat a heavy bottomed wok with oil on medium flame and once heat deep fry them until golden brown and transfer to a serving platter with chopped coriander leaves and lemon wedges. Add all the ingredients expect the prawns in large bowl and mix well. Keep aside. Wash the prawns well and pad dry with a kitchen towel. Add the prawns to the batter and well. Refrigerate overnight. Heat oil in wok on medium flame and fry the prawns til tender and crisp. The quick and easy recipe of stir-fried mixed vegetables is a delightful combination of oyster sauce and soy sauce. Heat oil in a wok, on high heat until hot. Add the mixed vegetables and fry for one minute. Add beansprouts and fry for two minutes. Pour in one ladle of stock and leave for two minutes or until it is starting to boil. Then gradually add the 2 tablespoons of cornflour mixture. Once this mixture is well incorporated the sauce should thicken. Lastly add in salt, soya sauce and oyster sauce. Serve top with toasted sesame seeds. 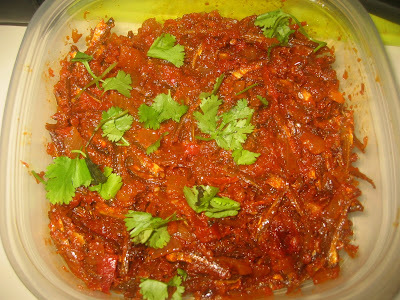 It is important to fry Ikan Bilis at the correct oil temperature and for the correct length of time so that they are crisp to the bite and not burnt. Rinse the cleaned anchovies 3 times to remove excess salt. Dry thoroughly with kitchen towel. Heat the cooking oil in a wide pan add in anchovies, stir occasionally. When anchovies have turned golden-brown and amount of bubble has reduced, it is time to remove from heat. Drain and cool the fried anchovies on an oil strainer, the crispy fried anchovies are ready to be served! Rinse the peanuts and drain. Add peanuts along with the oil to a pan, turn on heat up to medium-low. Shake your pan from time to time. After 4-5 minutes, there will be “pa” sound in the pan. Turn off the heat and shake the pan for another minute. Transfer out and filter any oil. Sprinkle the salt and mix well - keep side.To finish of the plate slice some fresh cucumbers and arrange the your plate of Nasi Lemak. Enjoy!! !